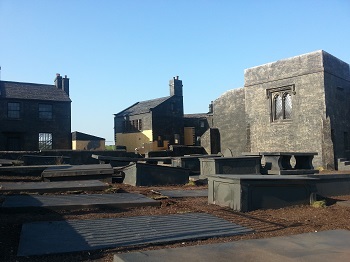 The Penistone Hill Parsonage was one of several temporary structures which were constructed on Penistone Hill in the springtime of 2016 to serve as replicas of the Haworth parsonage and the surrounding buildings for the filming of a BBC drama about the Brontes called "To Walk Invisible". 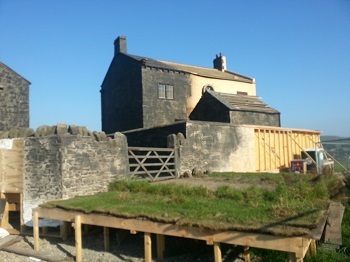 The original parsonage itself has of course been used in countless dramas and documentaries about the Brontes, but the new structure was a recreation of the building as it was when they lived there - changes having been made to the original parsonage since the 1840s (when "To Walk Invisible" is set). 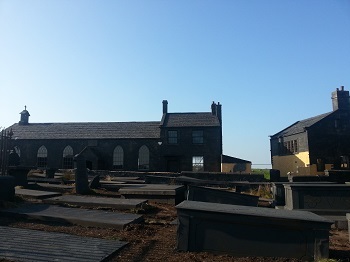 Besides the parsonage itself there were also mockups of the Old School Rooms (pictured above) and the Haworth churchyard - complete with replica gravestones with authentic inscriptions ! 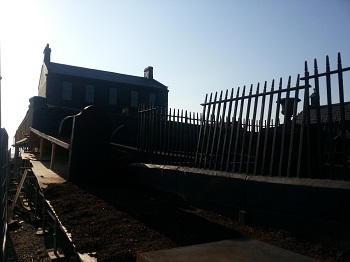 For more information please see the separate news item entitled "Haworth parsonage recreated on Bronte moors".